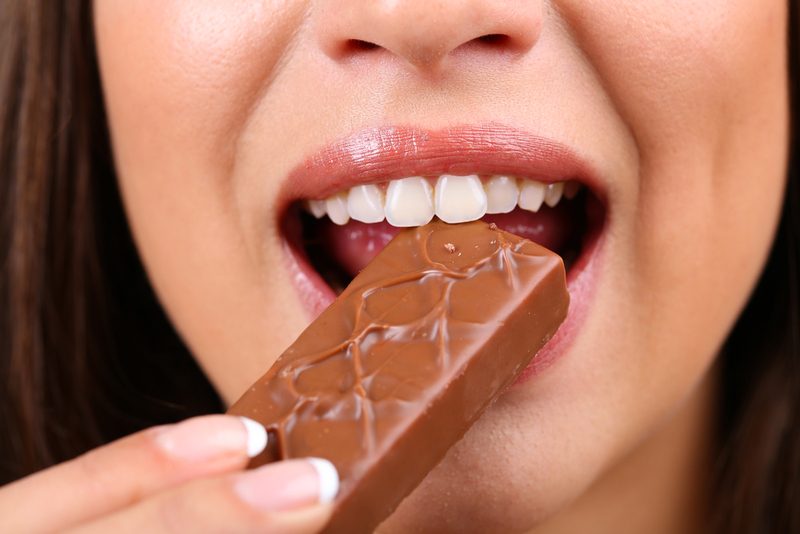 Is chocolate bad for your teeth? Well, the answer is “it depends!” Different types of chocolate are better (and worse) for your teeth, and tooth decay from chocolate can easily be avoided with just a few precautions. Chocolate is not, in and of itself, more harmful to your teeth than any other kind of sweet treat, such as soda, hard candy, or other sugary snacks. Consuming a lot of chocolate can result in bacterial growth and tooth decay, but this is true of all other high-sugar foods. However, not all chocolates are created equal. Milk chocolate is the most popular type of chocolate, but it’s also loaded with the most sugar. Because it’s so sugary, milk chocolate has a larger effect on your oral health than other chocolate types, such as dark chocolate or white chocolate. In addition, many milk chocolate confections contain fillings that are equally sugar-packed. Fruits like cherries are coated in syrup and drizzled with milk chocolate, sugared nuts may be packed in chocolate shells, and caramel and nougat are also common in Valentine’s Day chocolates. In contrast, more natural dark chocolate that contains a higher percentage of cocoa and less added sugar is much less harmful to your teeth. In fact, there is some evidence that the polyphenols in dark chocolate could even help fight cavities! Don’t worry, though. Even if you love indulgent, sweet milk chocolate, you can avoid cavities from chocolate with just a few simple steps. Want to eat chocolate without compromising your oral health? Follow these tips! Wash that treat down with some water – Milk chocolate has a tendency to stick on and around our teeth. This is especially true if your favorite chocolate includes nougat or caramel. If the sugars are not removed from your mouth, they will contribute to tooth decay.However, simply swishing with some water (or even just drinking a glass) can rid you of the majority of chocolate particles in your mouth, lowering the effect chocolate has on your oral health. Don’t snack on chocolate all day – If you’re going to eat chocolates, limit yourself to just a few snacking sessions. Snacking on chocolate all day leads to a prolonged increase in sugar in your mouth, allowing bacteria to create much more acid, which leads to tooth decay. Consider chewing some gum after eating chocolate – Chewing gum with xylitol helps remove any chocolate bits that may be stuck in your teeth. Xylitol gum can also help neutralize acidity, restoring a healthy pH balance to your teeth. Don’t stop brushing and flossing – You should be brushing at least twice a day. And if you can, you should consider brushing after you eat chocolate. Brushing your teeth will blast away all the remaining sugars and chocolate bits that can encourage tooth decay. Come To Priti Naik, DDS For Tooth Colored Fillings In Tysons Corner! At the office of Dr. Priti Naik, we focus on restorative and preventative dentistry in Tysons Corner and in Vienna. At our family dentist in Vienna, we can help you understand how what you eat affects your oral health, and give you advice on how to prevent cavities and tooth decay. Whether you need tooth-colored fillings in Vienna, or just a new family dentist in Vienna, we are an ideal choice. Learn more about our approach to general dentistry from our patient testimonials, and contact us to schedule an appointment with Dr. Naik today. Give us a call at (703) 293-5778, or come to our office at 8230 Boone Boulevard, #320 Vienna, Virginia, 22182.